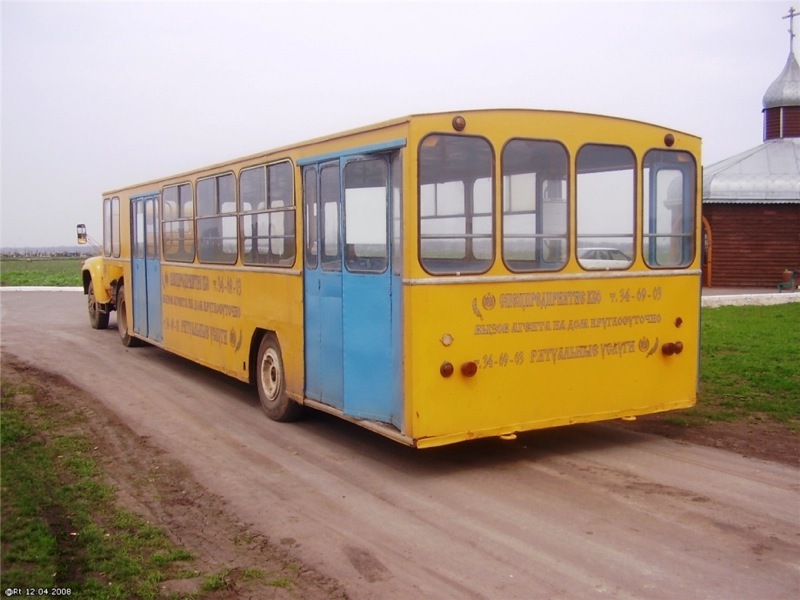 If you had flight to Odessa, you could be met in the weirdest airport shuttle bus I’ve seen. Actually, it’s not even a bus but a part of bus towed by a Russian “ZIL” truck. And also it has an ad at the backside, this ad reads “Ceremonial services. Call agent to your home”. it’s an airport shuttle truck….. just be cause it’s yellow doesn’t mean…. oh, never mind. Actually there is a sign – “Ritual services”, that`s not airport shuttle bus. Offtop: Bogdan buses are the hateable stuff. quite ordinary for any small town in any contry. 2 days ago was returning back from Ukraine and airplane made a stop in Odessa. There was a small house and field inside the airport terrace, between secondary airways and old man taking care of his garden waived at us, as we were taxing!! That’s the most weird things I’ve seen in airports in my life! I am going to odessa in july, i would love a ride on the bus! Russian airports have much nicer shuttle buses! 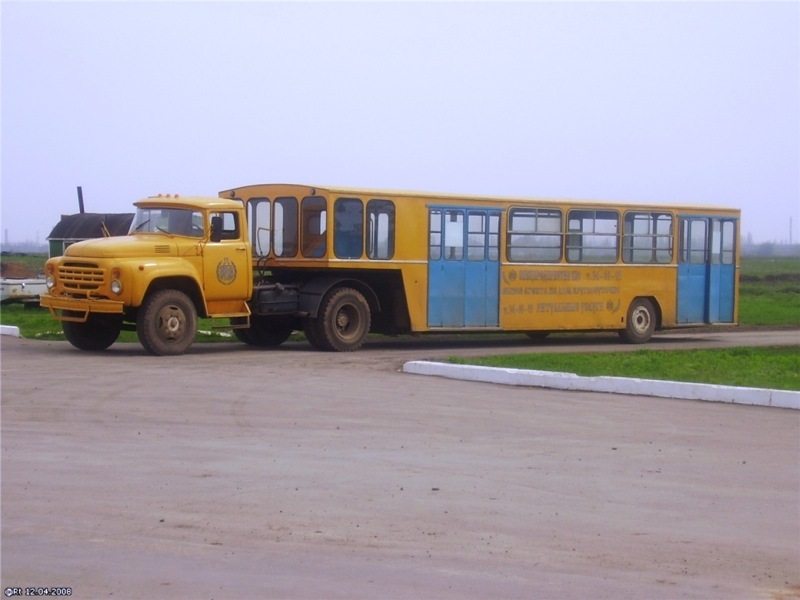 This seems to be some kind of soviet thing… cause in Cuba the public buses, or city buses are like this one. Although they have bought some nice urban buses like the ones in europe a while a go. In Ukraine, airport shuttle rides YOU. Such a sophisticated mean of transportation would duly dignify the spirits of Soviet citizenry. Now it is time for Ukraine to present this true miracle back to Russia as a token of recognition of the former’s technological superiority. (1) It beats walking, especially in poor weather. (2) Back when only U.S. Sailors and Castro hated Guantanamo Bay or even knew where it was, there was a similar style of shuttle there. It was based on U.S. truck products but it was made the same shape. We called them ‘cattle-cars’ too, but a bus is a bus. One waits for it, rides it, and walks away. How the engine and controls relate to the passenger compartment–doesn’t matter a lot. It’s still just a bus. Best regards. (1) Cattle-car buses are no worse a ride for the passengers, unless a passenger feels entitled to “supervise” the driver. For this reason, it would be less challenging to recruit and to retain good drivers, as they don’t have to play Confessor, Whipping-boy, & Baby-sitter roles as well as drive. (2) The tractor & trailer portions are 2 separate maintenance issues. Both are likely to be manageable with fewer specialized pieces of shop equipment. So the cost of keeping such a bus safely running will be less than it is, for some stylish bus whose engine is hidden away underneath. If the tractor for one of these cattle-car buses needs maintenance, you just uncouple it and hitch up another. So the whole bus needn’t be removed from service. If you’re riding public transportation, your ride isn’t part of your fashion-statement anyway. Best regards. It is old APPA-4, low-floor airport shuttle. They used 20 years back, or more. A driver sits separately on considering airport safety – bus can not be taken. There were not places for a seat. Passengers rode only upright. Apparently, considered that this comfort is enough for a 3-minute journey. Now this shuttle works on a city cemetery! Thank you. Those newer ones are not bad looking. The concern over hijacking the bus, unfortunately, makes sense in today’s market. If a passenger comes in a wheel-chair, in an all-standing bus it should not be a problem. Best regards. This one bus is for carrying people on cemetery area. There is church and graves on foto. 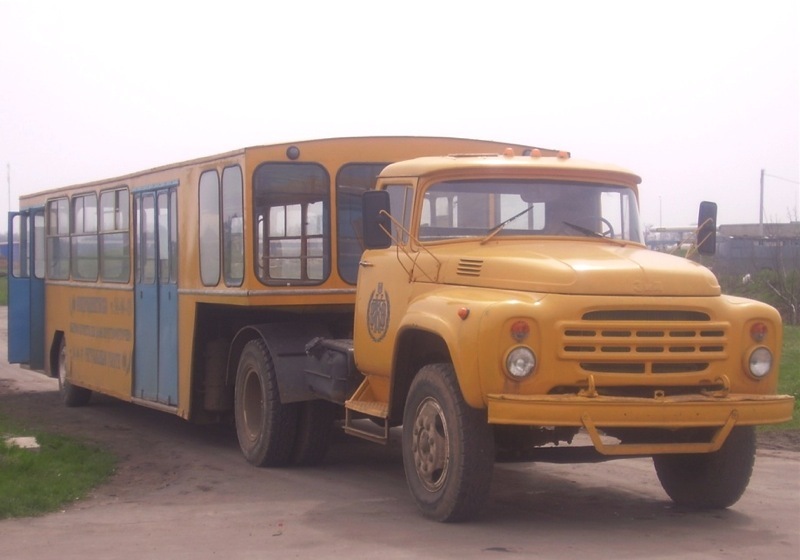 In the USSR’s provincial airports these shuttle buses were used to transport passengers ONLY from exits directly to planes. But I guess all them was retired probably more than 20 years ago, but as Alexander from Odessa had said, some private funeral service bought for cheap price and still use it due to large distances on cemeteries.